Be careful when opening the foil packets, as the steam will be quite hot, but do savour all those lovely smells. Preheat the barbecue to a medium-high heat. Cut the lemon in half and cut one half into slices. Rub the skin of the salmon with the olive oil. Using enough tin foil to make a pocket to take one darne each, place the salmon darnes inside, skin side down. Season the salmon with salt and pepper, then put half a handful of sage and one sprig of rosemary on top of the salmon along with two slices of lemon. Juice the rest of the lemon and drizzle it over the salmon, then seal the foil packets. 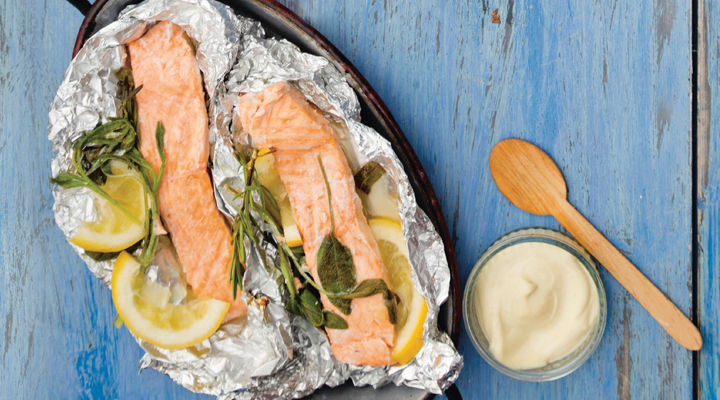 Cook for 15 minutes on the barbecue and serve in the foil on a plate.